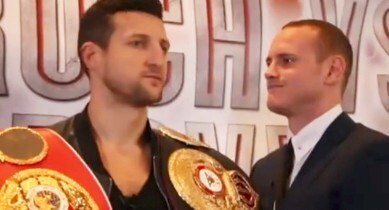 We won’t have to wait too long before we witness the rematch between Carl Froch and George Groves, May 31st to be exact, which is being staged at a sold-out 80,000 capacity Wembley Stadium. So I thought I’d provide my own view of the controversial ending of their first encounter and also express an opinion on the likely outcome of the rematch itself. Just to be clear, when reviewing the first fight, I believe that George Groves had a comfortable lead on the scorecards, despite whatever the official scorecards claimed, and also thought that the ref’s stoppage was premature. However, I’m convinced that this was a classic case of one punch too soon or one punch too late. I feel that Groves put the referee in a difficult situation by not defending himself effectively when he was on the receiving end of Froch’s relentless onslaught. The first thing any boxer is taught, is also the last thing they’re told before the start of any contest, which is to “protect yourself at all times”, and unfortunately, George Groves failed to do that. In the events leading up to the 9th round stoppage, Carl Froch landed more than 20 unanswered punches. For sure, some of these may have been glancing blows, but a lot of them were powerful cleanly-landed shots. Groves didn’t try to clinch Froch and his guard was ineffective. In fact, at the time of the stoppage, George looked exhausted leaning on the ropes and aimlessly flailing shots that failed to hit the target. He simply wasn’t protecting himself “at all times”. The ref’s perception of George Groves’ being in such a vulnerable position was compounded by the fact that he was stunned once or twice during the previous round and also appeared to be tiring. Therefore, when there is such an obvious pattern: when a boxer appears exhausted; is no longer blocking punches nor landing any of his own; coupled with the fact that he was also stunned a few times shortly before stoppage… may have compelled the referee to be overly cautious and stop the contest. Whilst I agree with general consensus by declaring the stoppage as premature, I also feel that if Carl was allowed to land two or three more blows, this would have also compelled some people to complain about the ref’s intervention being far too late. In terms of the rematch, even though I feel that Carl Froch is past his prime, he may have underestimated George Groves’ ability in the first fight (as he’d even injured his back whilst competing in the ‘Stepping Out’ reality TV show).The man from Nottingham had previously gone on record by stating that his domestic rivals (Groves & DeGale) were not worthy title challengers and simply not on his level. I also believe that the devastating nature of the first round knockdown may have “ruined” Froch for three or four rounds, because it seemed to take a while for him to regain his composure. This “wonder” punch may have flattered Groves’ performance somewhat, as he failed to hurt Carl when some of his bigger shots connected cleanly from the mid-stages of the fight onwards. That being said, if we don’t see a much more motivated and improved version of Carl Froch in the rematch, then ‘Saint George’ will almost certainly gain his revenge. I’m very confident that Groves will be unable to repeat the feat that he achieved in the first fight when he floored Froch with such a devastating blow in the 1st round, because I believe that he simply landed a fluky punch on a “cold” and unprepared version of Froch. I feel that the public outcry of the so-called “robbery” from the first fight will compel the judges’ to favour the title challenger when scoring any close rounds. This means that Froch will either have to dominate his opponent or score a knockout to win, because if the contest is even remotely close on the scorecards, in light of the way the last fight ended, then George will emerge victorious by gaining a unanimous point’s verdict. If ‘Saint George’ stands toe-to-toe and goes for the stoppage, like he did in the first fight, then he’ll have to win inside eight rounds, otherwise Froch’s superior inner strength and resilience will overwhelm Groves and give him the opportunity to force a late stoppage (much akin to the Jermaine Taylor fight). Therefore, I’m predicting that this contest will follow a similar pattern to the first fight, though less action-packed, because both men will be wary and very respectful of their opponents’ abilities. George’s superior boxing ability and cleanly landed punches will allow him to obtain a clear lead on the scorecards by the end of the sixth round. However, I thoroughly expect Froch to gain the winning momentum from the seventh round onwards and will score a late stoppage sometime around the 11th round mark, because if he doesn’t, then Carl will lose this fight on the scorecards.